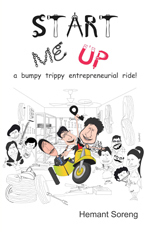 - a bumpy trippy entrepreneurial ride! Andy wants to start a company, one of his innumerable dreams. Ronnie, his MBA batchmate, is frustrated with his job. KS, his techie colleague, wants to erase his earlier entrepreneurial failure. Three different reasons for three different individuals to start a company. Trek to the holy grail of mountaineering - the Everest Base Camp, with long hair, no bath and only dal bhat. Beautiful trek to Dzongri and Goecha La to view the captivating beauty of the third highest peak - Kangchenjunga. Zen of a high-altitude summit climbing experience with Mt. Shitidhar peak in the Western Himalayan Pir Panjal range in Himachal Pradesh. Experiences of a solo trekker (not to be confused with alpine climbing) in the heavenly Dayara Bugyal (meadow) in the Garwhal Himalayas. One of the most popular and beautiful treks in India in the Kumaon hills. The beautiful Annapurna Circuit, one of the best treks in the world...unforgettable...ever-surprising and surreal.